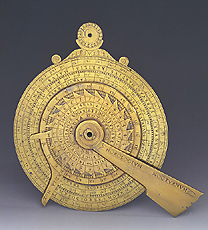 The back of the instrument bears the height-quadrant, divided into 90?, and the hour lines for the sundial. The dial, calibrated for a latitude of 43? 30', is dated and signed by Girolamo della Volpaia, the son of Camillo and a maker of measuring instruments.